D-L roller bunks provide a quick, easy and inexpensive way to upgrade bunk style trailers to rollers. 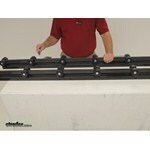 Call 800-298-8924 to order Dutton-Lainson boat trailer parts part number DL21755 or order online at etrailer.com. Free expert support on all Dutton-Lainson products. 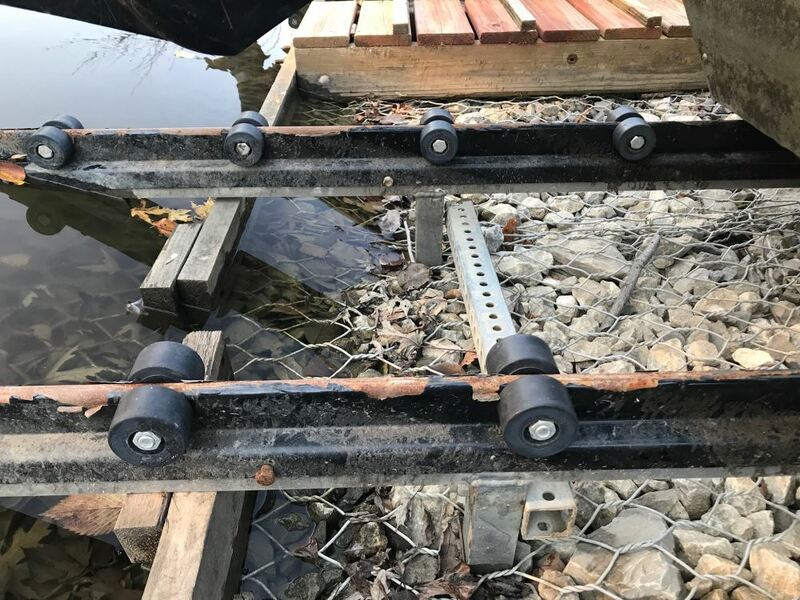 Guaranteed Lowest Price and Fastest Shipping for Boat Trailer Standard Roller Bunk - 5' Long - 12 Sets of 2 Rollers - by Dutton-Lainson. Boat Trailer Parts reviews from real customers. D-L roller bunks provide a quick, easy and inexpensive way to upgrade bunk style trailers to rollers. Today were going to review part number DL21755. This is the Dutton-Lainson Boat Trailer Standard Roller Bunk in five foot long sections. These Dutton-Lainson Roller Bunks will provide a quick, easy and inexpensive way to upgrade your bunk-style trailers to rollers. They feature a non-marking two-compound roller which has a durable wear-resistant inner surface and a soft boat cushioning outer surface. These roller bunks are designed to attach directly to your wooden bunks that are two inches wide on your boat trailer. Basically, you would set this on to your wooden bunk and there are holes right here, pre-drilled that you would just mark and then drill a hole through and then use a bolt to attach it to the wooden bunk. Now if your boat trailer does not have wooden bunks or you want to remove the wooden bunks, you can still use these. 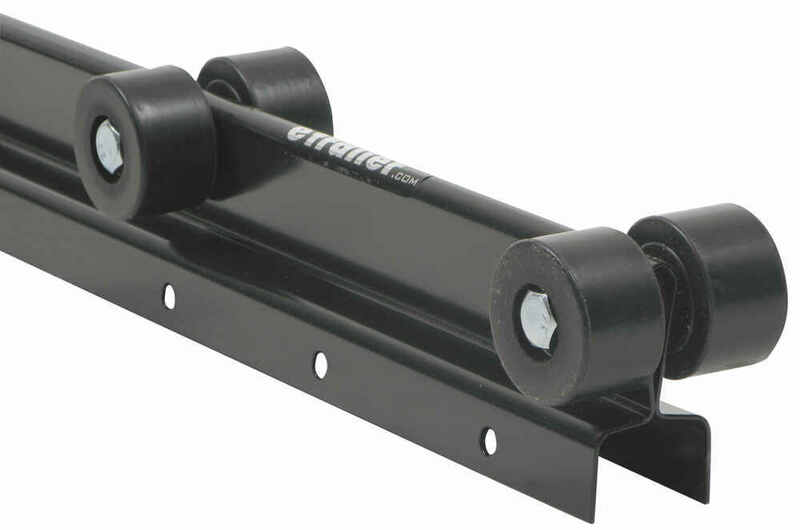 What you have to do is use this roller bunk bracket which is sold separately. Its part number DL21762 and you will need at least two of these for each section. And what these would do is where the bolts would normally go through the wooden bunk, you would just put the section that has the hook part on it right in the hole and then the bolt would gone through here and then with this bracket having the slotted holes, you can adjust it and bolt it to your boat trailer and get the correct height you need. This part is constructed of a 14-gauge steel, has a black powdered-coat finish, has a total weight capacity for both of these roller bunks is 3000 pounds maximum and again they are five feet long and they are two inches wide. The rollers on them are free to pivot and they will align with the boat hull. Each five foot section will have six sets of two rollers so 12 rollers on five foot section and 12 on another one. So over all for both roller bunks, you would have 12 sets of two rollers. This part is made in the USA. That should do it on a review on part number DL21755. Order: RelevanceNewestRating - High to LowRating - Low to High D-L roller bunks provide a quick, easy and inexpensive way to upgrade bunk style trailers to rollers. The roller bunks are still working however the metal frames are rusting very badly after 1 yr. If you can make these in galvanized metal you will really have a winner. Ill keep checking back to look for them. Yes, all products are as expected.Thank you. $168.63 but even then they are susceptible to rust if underwater for long periods of time. They worked great...but i have sold that boat and trailer since then. I may be interested in getting some wheel bunks for my latest boat. If your Dutton Lainson roller bunks have a flat bottom surface like part # DL21741 then you can mount them directly to the CE Smith Bolster and Swivel Bracket Assemblies # CE10196G-4 as shown in the linked photo. These are the tallest ones we offer. If the bunks have an open channel in the bottom, like part # DL21755, then you will want to first mount the bunks to a 2 x 4 bunk board which will fit into that channel and then mount that to the brackets. We had a customer use roller bunks # DL21741 on a boat ramp he built for this same exact purpose. And it worked out great. Take a look at the pictures I have included. The key is to have enough rollers for the length of the ramp and to support the weight. The roller bunk sets are rated for a maximum of 3,000 pounds. There are 2 bunks in a set, 5 feet long each. You can get them from us and the current pricing is available on the product page. The longest size of roller bunk we offer is 5-feet, part # DL21741 which has sets of 3 rollers and part # CE27710 which has sets of 2 rollers, both from CE Smith; and Dutton-Lainson # DL21755 which also has sets of 2 rollers. All of these are offered as a pair. We also have 4-foot roller bunks that are similar to those above and which are viewable by clicking on the included link. I have linked our main page for all boat trailer parts in case you're interested in other items. I spoke with the Dutton-Lainson Engineering department, and the rollers are 5 inches wide, outside to outside. 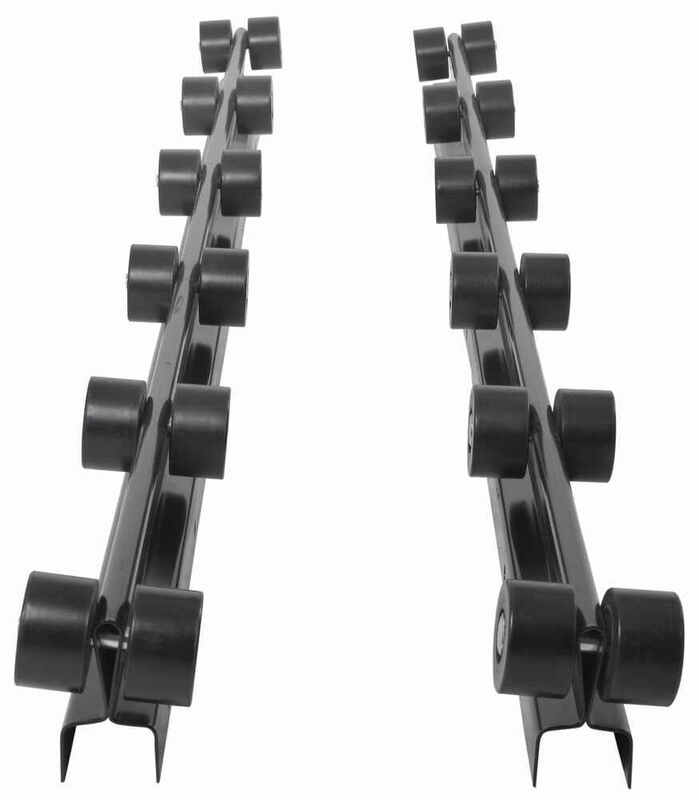 The Boat Trailer Standard Roller Bunk # DL21755 that you referenced is sold in pairs. If you order a quantity of one we will ship you a pair. I attached a review video for this product for you to check out also. The 5-foot roller bunks # DL21755 can be attached directly to vertically-mounted 2 x 4 bunk board. I would suggest using stainless steel or galvanized hardware. Another option is to use the # DL21762 brackets, 4 brackets are needed to mount a pair of roller bunks. With the brackets, the bunk can be adjusted vertically and can be angled for a custom fit to your boat hull. I have posted a short video showing how the bunks attach to a 2x4 and to one of the brackets for you to review. To be able to mount roller bunks to your trailer and allow them to be angled to match the hull of your boat there are rollers and brackets that will work for you. 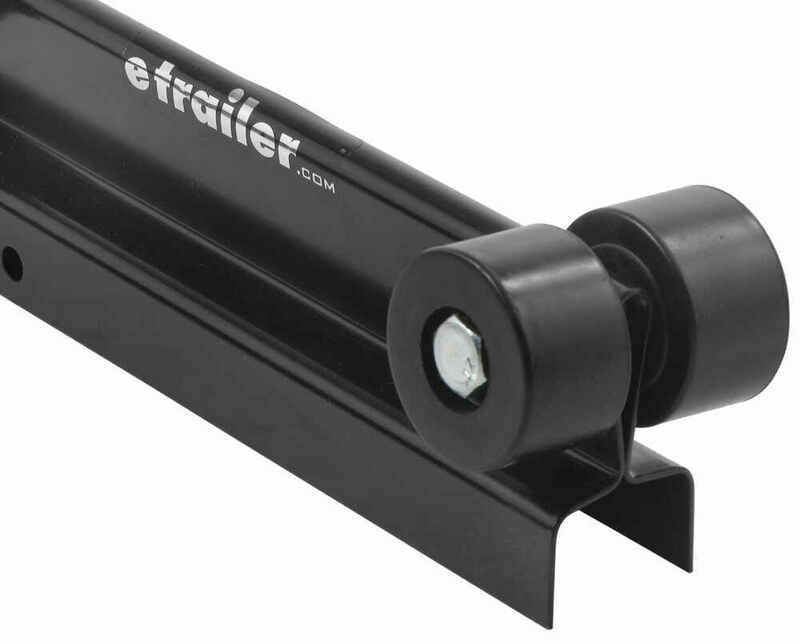 You will need to use the Dutton-Lainson Boat Trailer Standard Roller Bunk, part # DL21755. 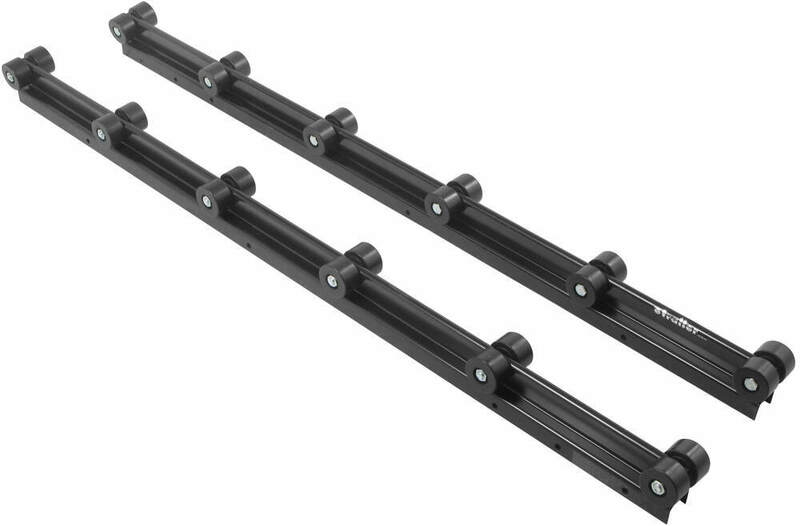 These are black rollers that are 5-ft long. There are 12 sets of 2 rollers with this set. The brackets that can be used with these rollers is part # DL21762. Four brackets are needed for a pair of roller bunks. If I am understanding you correctly it sounds like you are saying you have 2 12-foot bunks and 2 6-foot bunks. For the 12 foot bunks you would want to get 3 sets of 4 foot long bunks. So that would be 3 of the Dutton Lainson Bunks part # DL21754. For the 5 foot long bunk I would recommend you go with the bunk part # DL21755 that you referenced.